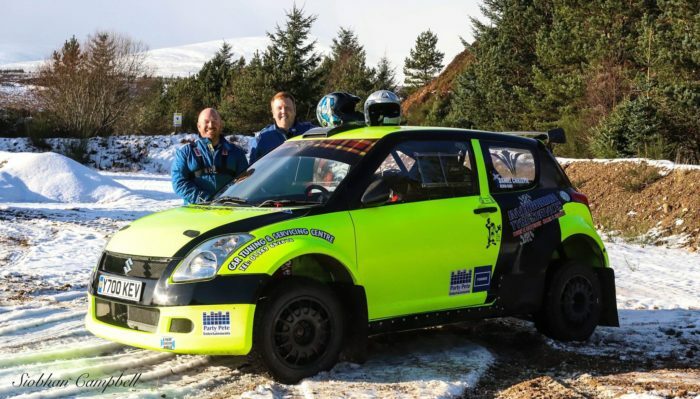 Invergordon driver Kevin Gray is set to return to the KNC Groundworks Ltd Motorsport UK Scottish Rally Championship (SRC) in 2019 behind the wheel of a home-built Suzuki Swift. Gray was last seen on the stages in 2017 where he battled for the Class 6 title in a Vauxhall Astra, but skipped the entire 2018 season as he began to build his very own Suzuki. Once again wading into the Class 6 battle, Gray is lofty with his expectations and delighted to be driving a car that he used to watch in awe in the Junior World Rally Championship. “I fell in love with the Swift S1600 when the juniors used to rally them in the WRC,” he said. “I later came to realise that they were an extremely well designed and put together car. I had no intentions of going rear wheel drive or four wheel drive. “A front wheel drive car with the same footprint as most four wheel drives seemed like the way to go; not to mention the fact I really do just love the way the Swift looks in its wide body stance. “It took a lot longer than planned,” Gray admitted. The car has strong potential to be one to watch on the stages. Producing 240bhp from its two-litre Vauxhall engine, the Swift has several custom-built parts installed including a custom stainless steel exhaust system and drive shafts. Although it isn’t an S1600 car like the one Gray fell in love with, it will look the part with an S1600 body kit. “This means everything,” Gray continued. “It is a massive achievement to not only realise a dream by rallying, but to enter this year in a car completely designed and built by myself and a very few close friends. Gray is seeded 48th with Daniel Christie alongside for the Coogie Urquhart Snowman Rally this Saturday.